The Colorado river toad (Bufo alvaris) is the family of tailless amphibians, the biggest toad lived in the wild life of USA. The adults are very big, they can reach the size more than 19 cm and have the weight more than 900 gr. Usually, they live 5-15 years, but the elder river toad died in the age of 36. The Colorado river toad have the bad reputation because of the discovering of the hallucinogenic properties of secretion from the paratoid glands. Directly, it's the Bufotenin 5-HO-DTM and Metylbufotenin 5-MeO-DMT that are the strong psychoactive elements from the tryptamine's class, close to DTM. The chemical formulas are (C13H18N2O1) and (C12H16N2O1). The poisoned glands of animals are situated back from the eyes, under the ears and on the legs. The drug (the substance looks like a milk) is strong enough to kill the cat or little dog and, perhaps, the man if he consumes the big dose. Also the drug can seriously enough irritate the eyes or mucous. The drug begins to exude actively if the toad feels the stress. The one adult toad can exude 0.5-1 gram of poison that becomes lighter after its drying and have 15 % of metylbufotenin (and 3% of the more toxic bufotenin) when somebody makes a light massage of poisoned glands. 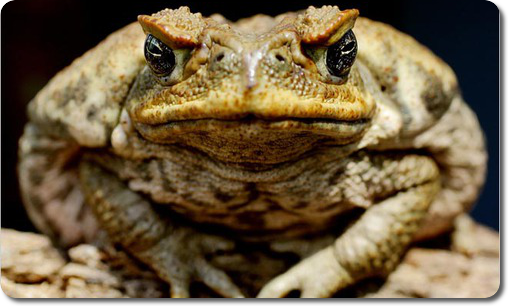 The giant toad (Bufo marinus, the synonyms: cane toad, marine toad) is the one of the biggest toads. It can have the height 25 cm. The native land of these giants is the Central and South America. The marine toad is more poisoned than its desert relative alvarius. The poison of the giant toad is the complicated cocktail of 14 chemical elements that make influence to the heart and nervous system and calls the saliva flow, cardiac dysrhytmia, blood pressure, jerks and death. Among them there are the metylbofotenin and bufotenin. The fans of Psychonautics aven doesn't stop the fact that Bufo alvaris and Bufo marinus have the death-doing cardio toxic poisons Arenobufagin and bufotalidin. The averege death-doing dose of these poisons is approximately only 0.08 mgr per 1 kilo! The hallucinogenic properties of the red ants Pogonomyrmex californicus are used be the Red Indians in the rite of passage. The juvenile who wants to find out the "ghost ally" have to go through this rite under the guidance of woman shaman named "ant's doctor". They both goes to the uninhabited place. The young person lays and the woman shaman gives him to ingest the nubbles of the eagle's fur hairs, each of them have about 4-5 alive ants. After the ingesting of about 400 ants the woman shaman begins to roll his body on the earth, making the ants to bite the inner wall of the stomach. Under the influence of the ant's poison the poor boy begins to see the hallucinations in which he has the contact with the ghost ally. After the finishing of the procedure the young Indian drinks the warm water and calls the vomit and the safe and sound ants have to "go home". The Indians believe that if the ants will die, the person dies too. The procedure can repeated a few times a day for 3-4 and more days until the ants go up and leave the body. It's considered, that when the ants find out "the way home" the contact with the ghost ally is finished. The unidentified psychoactive element of the red ants is very toxic. Groark P. estimates that during the dangerous ritual the 35% of the death-doing dose of the poison penetrates into the body. In 1824 the French missionary Augustin de Saint-Hilaire during the travel in Brazil had learned the routine of the Indians of the tribe "malali". The slug of the butterfly Myelobia (Morpheis) smerintha was among the favorite delicacies of the Indians that lives inside the stalks of bamboo and can reach the size of 10 centimeters. The traveler couldn't overcome the desire to taste it and after that he wrote that the smell and taste of this delicacy is like the most tender cream. Before using, the head of the slug is turned away that is considered to be poisoned and always extract the entodermal canal. If the entodermal canal is not extracted than the effect will be another. The Indians-malali when they have the emotional arousal and insomnia, they take, as the sleeping peels, the powder from the drying slugs and after that they fall into the ecstatic sleep. This condition is like the narcotic sleep of the opium smokers and can be longer than a day. They have the amazing dreams in which they see the beautiful forests, eat the tastiest fruits, their hunting is very successful. Despite of the pleasure of this time spending, the Indians consider it very exhausting and use it rarely. The psychotropic insects are very rare. The light psychedelic properties have the wasps' poison and the bitten people notice the strengthening of the colors and geometric forms' perception. The Egyptologist Wallis Budge describes then Sudan's residents mix with water the powder of the minced screech beetle and drink it as the alcoholic drink. There are a few mentions about neurotoxin of some kinds of bird spiders that calls a strong drowsiness. Conversely, in Laos the spiders are used for making pills that have the psycho stimulating effect. They are used in the casino as a pills for brains. In the East also the scorpions are used for making calming and narcotic product. There are the occasions when eating of some kinds of mullet leads to the intoxication with hallucinations and nightmares. The symptoms appears after 10 min - 2 hours and can be longer than a day. The heavy case can bring not only to psychic disorders but also to paraplegia and anemia. The similar symptoms have the intoxication of another fish named the goatfish (Mullidae). In 1960 Roughly describes the dreamfish inhabited in the waters of the Norfolk island. The resident said the eating of this fish call a terrible nightmares. The photograph Joe Roberts from the "National Geographic Magazine" decided to try the fried dreamfish. The next morning he said that it was like a pure scientific fantastic fiction. Among the dreams that he saw he remembered the most of all the new model of auto and the monument dedicated to the first flight in the open space. The hallucinogenic fish was identified, it was Kyphosus fuscus. their application can be performed only by the attending physician. Be sure to consult with a physician.